Retro look is so much fun and beautiful to create. I love the colors and quirkiness that it brings. Retro is the way to go if you have a love for design that is distinct, colors that add to dimension and style that is unparallel. A far cry from classic or understated, it is a design that has to loved totally before you recreate it in your home. I have put together a set of ideas for home design, dining area is specially the soul of the home, with family enjoying meals together and entertaining friends and building memories. I specially adore the clean lines and curved shapes of dining chairs, while the simple table with basic shape and color provides the perfect foil. 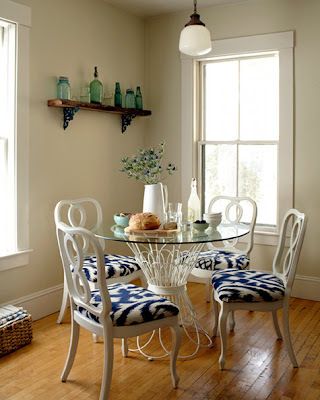 Retro white circular table with laminate chairs and vintage table ware. I love how unique and cheerful the whole look is. The dining room is so full of memorabilia from past and put together with the distinct retro vintage panton chairs, the room is elevated to a testament from the 60s. Lucky ! 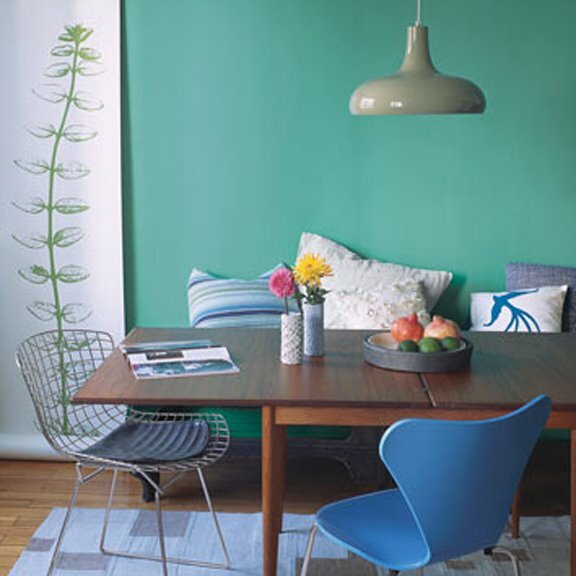 Retro design and decor are know for its vibrant colors. The whole setting is so simple yet sophisticated. The design is interesting and keeps the atmosphere light and beautiful. Its all about keeping it unique and interesting. Retro is know for its fun and whimsical design. Use your imagination and create your very own space. How elegant and stylish. 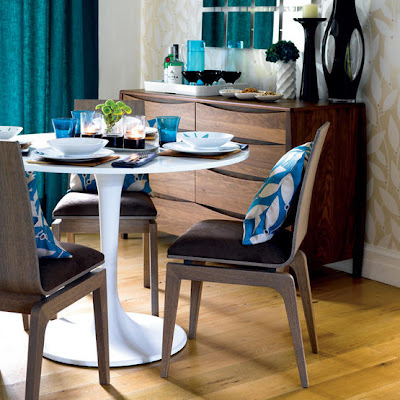 Beautiful ikat print on the stylish chairs, with the absolutely stunning iron table base. I would love to snag this up any day. My favourite :D Retro is the way to be ! Lush colors and lots of it. Not for the faint hearted, enjoy the retro style that way it should be, wholeheartedly ! There is no place for toning down here and yet the energy and vibes are so positive.